All texts © Gertie Grumbles 2012. Please respect my efforts and do not circulate to others. I created three engaging characters and crafted a full suite of texts around them, 30 texts altogether. They are pdfs in landscape format - better for showing on PCs or IWBs but OK to print, too. 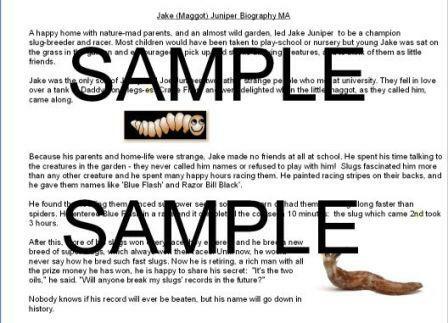 3) Jake Juniper, who trains super-fast slugs that win world records for races - and how he does it. - A fact-file on each character so that children can create their own texts with plenty of things to write about, with or without seeing any examples. 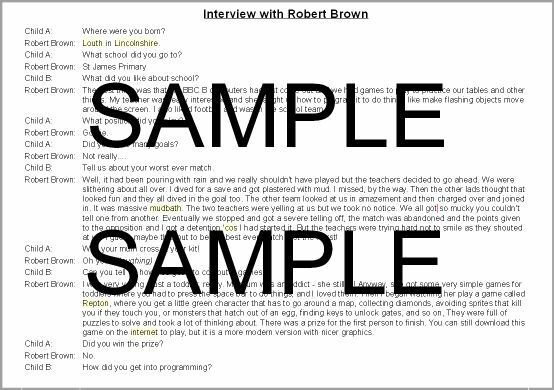 - A set of interview questions showing open and closed questions asked of each character. - One flashback story about each character. 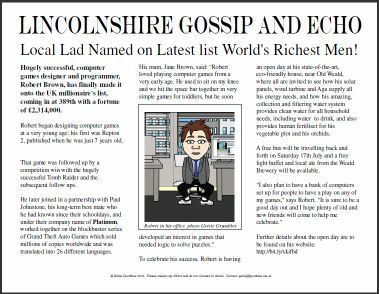 - One newspaper report about each character. Some samples - obviously very poor resolution!!! - Give the children a text in one genre and ask them to use the information to re-write it in another. - Show the children the examples of a genre and get them to pick out key features. - Or show the children a set of the texts , eg the Cookie Brooks biographies, in reverse order and talk about how improvements can be made with subsequent re-writes. - Or give them the news report and factfile on any character and ask them to create any of the other formats. As children get to know the 3 characters, writing about them will become much easier, as they will know the expected content and be able to concentrate of key features of each genre. Please make it a personal payment so that I don't get charged a fee. In the 'message to recipient' box, please be sure you say which collection you want. As soon as I receive payment, I will email a zip file containing what you have asked for. so please respect my efforts and do not circulate to others. Please simply refer them to my website or pass on my email so they can buy their own set!